February is American Heart Month, an ideal time to commit to making small changes that can lead to a lifetime of heart health. Did you know that cardiovascular disease is a major threat to senior health? The American Heart Association reports that 84 percent of people age 65 years and older die from heart disease. Here are seven smart heart-healthy tips to help seniors take care of their hearts and reduce the risk of heart disease. If you are an adult child caring for your parent, here is some advice you can give them to promote well-being and help them live a healthy lifestyle. Maintain a healthy weight. Extra weight may increase the risk of heart disease, high blood pressure, type 2 diabetes, and bone issues. Maintaining an ideal body weight is tough, especially as you age. Therefore, eating right, portion control and exercise are the keys to a healthy heart. Fiber. Fiber. Fiber. Including fiber in your diet is crucial. It keeps you full and helps lower blood cholesterol levels. Fiber-rich foods, which include fruits, vegetables, beans, whole-grain bread and nuts, are great options to help keep your heart healthy. Get Moving. Regular physical activity is an essential aspect of a heart-healthy lifestyle. As little as thirty minutes of moderate exercise each day can help seniors improve their heart health and lower their blood pressure. Eat Colorfully. Seniors should get at least five servings of fruits and vegetables each day. They’re low in calories and high in vitamins, minerals, and fiber. Fill your plate with as many shades of veggies as possible, as each color indicates a concentration of a specific nutrient. If fresh fruits and veggies are not readily available, consider buying frozen or canned. These contain the same vitamins and minerals but are often more cost-efficient. Quit Smoking. Drink Less. Smoking tobacco products and drinking alcohol – no matter your age – can affect the heart. Smoking increases the risk of developing cardiovascular diseases, including coronary heart disease and stroke. Drinking excessive amounts of alcohol can cause raised blood pressure, which can lead to heart attack or stroke. Get Your ZZZ’s. Sleep deprivation or poor sleep quality can disrupt your metabolism, impact your blood pressure and increase inflammation in the body, which may lead to an increased risk of heart disease. Medicare.com recommends that older adults get eight hours of quality sleep each night. To improve sleep quality, try establishing a bedtime routine, avoid excess caffeine during the day and consider taking a short nap during the day. It’s never too late to start living a heart-healthy lifestyle to reduce your heart disease risk. If necessary, help your aging parent work with their doctor to keep health problems under control. 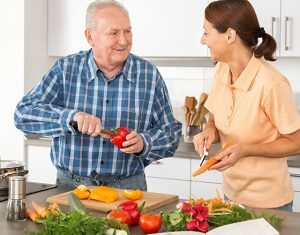 And if you need help with heart-healthy meal planning or transportation to and from exercise classes or doctor appointments, our Companion Care Services may be just what you need. Contact FirstLight Home Care today to see how we can help. If you would like to receive news, articles, and information like this each week, please subscribe to our weekly blog. We’ll deliver it right to your inbox every Thursday!